Rosa multiflora.2005 © Peter M. Dziuk.www.minnesotawildflowers.info. (Accessed 8/2014). 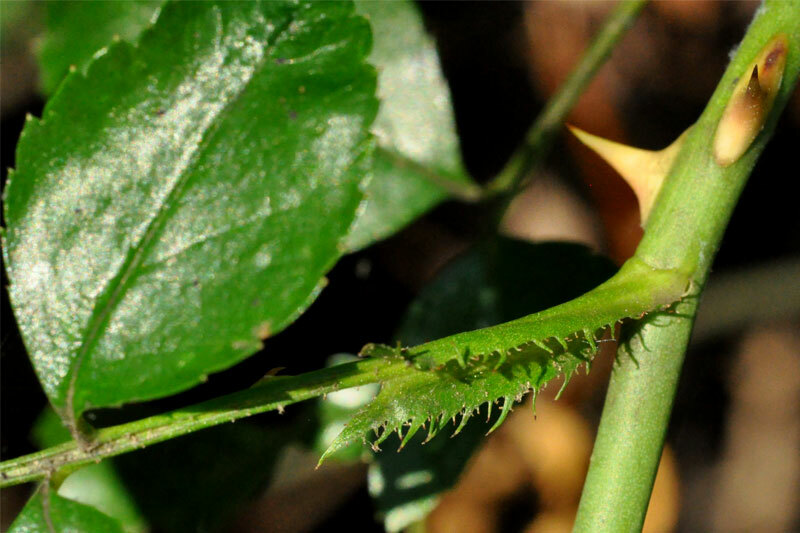 Rosa multiflora is a prickly shrub to 3 m tall, arching, sometimes climbing; colonial from root sprouts and layering (Young 1996); stems green (reddish in sun), smooth, arching or climbing, thorny, foliage semi-evergreen (Robertson et al. 1994), stipules toothed, fringed by glandular hairs (use lens). Leaves alternate, blade pinnate, leaflets 5-11, 1.5-3 cm long, elliptic, margin toothed, fringed. Flowers white, numerous, 1.5-2 cm wide (Rehder 1986), petals 1-1.5 cm long, in pyramid-shaped, branched clusters; blooms May. 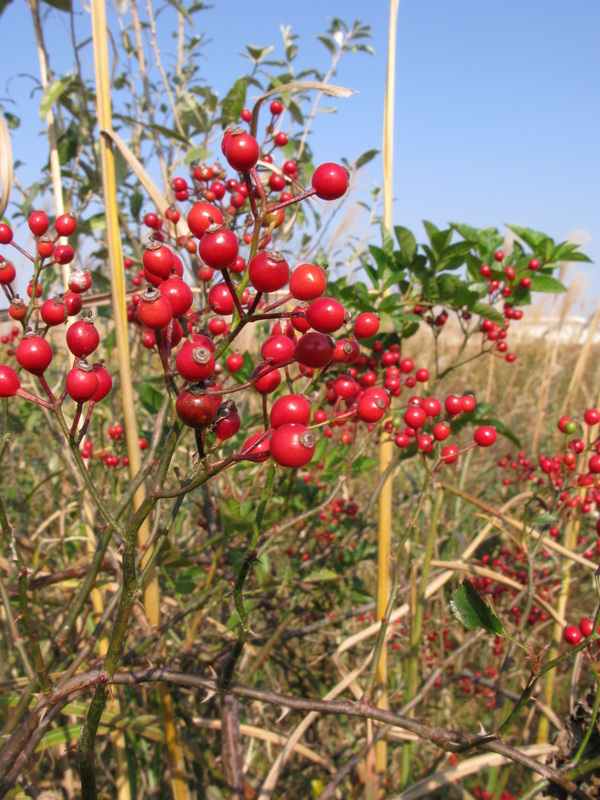 Fruit red, 0.6 cm long, elliptic, smaller than those of most other species, persistent into winter; eaten and seeds dispersed by over-wintering birds, seeds remain viable for several years (Evans and Eckardt, 1995). pulp lipid <10% (White and Stiles 1992). Habitat: Disturbed, open or partly shaded areas from wetland edges to moist uplands. Grows slowly in understories of open, moist forest but does not bloom well. A study of forest patches in upstate New York shows it to have invaded these sometime in the last 60 years (Hunter and Mattice 2002). In NYC found in soil with pH 5.2-5.4 (Gargiullo unpublished data). Somewhat shade tolerant but eventually shaded out under closed canopy forest, does not invade dry closed canopy forests (Robertson et al. 1994). Notes: Stems and foliage eaten by rabbits and deer (Martin et al. 1951). Extensive naturalizing of this plant may support over-wintering Northern mockingbird populations (Stiles 1982a). 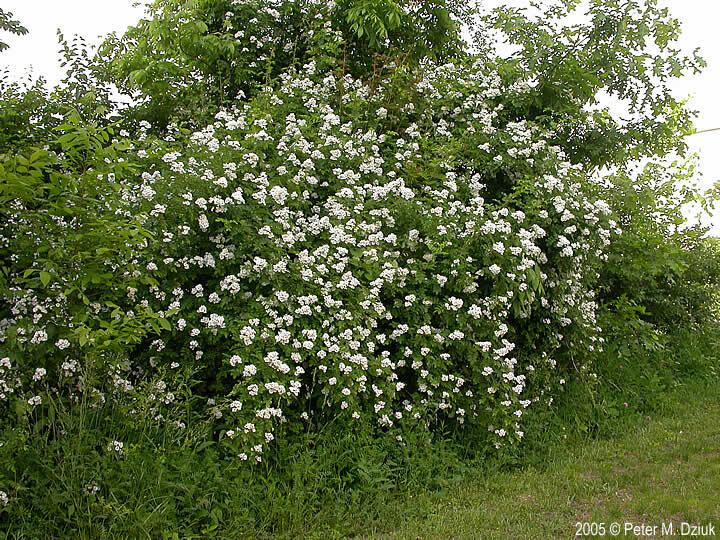 In the mid-west, multiflora rose is being killed by a virus or virus-like disease that is carried by the eriophyid mite Phyllocptes fructiphilus (Epstein 1993). Aggressive pest species. Displaces native plants in old fields, hedgerows, second growth stands and wetland borders, retards reforestation.